It's time for another round of Bout of Books! I'm going into this with no demands of myself - I'm just going to read however much I read. I did download an audiobook (or three), so that should help boost my numbers as well. Time to read! A Door in the Wall is one I think I would have loved as a kid, but I'm glad I discovered it now, at least! I can't believe how much time "reading" I can get in when I'm listening to an audiobook. I'll have to take advantage of that more often! I really liked The Governess of Highland Hall. It looks like you are having a good week so far. 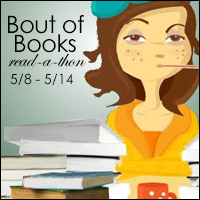 I didn't sign up to participate, which is good, because I've gotten almost no reading done this week... yikes!